It has been a year since the start of our Public Engagement Group (PEG). In this time the PEG has provided invaluable feedback and a platform for critical thinking about new projects and services. The PEG started in 2017, as an important part of Dorset’s Integrated Care System (which means services provided by the local authorities and the NHS working in a more joined up, coherent way). The PEG is made up of 25 local people. They have a wealth of lived-experience across Dorset’s geography, demography and diversity. They meet bi-monthly to provide advice, guidance and challenge across a huge variety of areas – including our approach to public engagement. Watch our video to see the group in action and to find out more. Developed a checklist and guide to encourage person centred discussions across the Sustainability and Transformation programmes (see image below). This has been endorsed by the Implementation Planning Group and will hopefully be shared for use across the Integrated Care System. The infographic below is also available as a download from our website. Provided Public Health with feedback on their Livewell Dorset website to inform it’s development. Given feedback on a new service during the planning stage, which is now out for procurement; the Social Prescription, Health Coaching and Voluntary Sector Navigation Service in Dorset. This will have ongoing support from a PEG member. Been involved with Digitally Enabled Dorset. A digital reference group is now being set up to support and shape thinking around the digital programme ‘Independent Self Care’. This is being supported by a PEG member, who will also be a link between the two groups. Provided advice around “How personalised care is delivered at home – emerging models of care.” – specifically on how to reach and seek views of the target population and how to use these views to inform the co-design of a future service. Similarly, we have been a part of the Dementia Review in Dorset, providing feedback which was used to inform new proposed models of care. Had the chance to comment on the One Acute Network draft public engagement and communication plan. ‘I passionately believe that all people in Dorset, regardless of personal circumstances or background, should have equal access, equal experience, and equal outcomes from Health and Social Care Services. Sometimes, this does not happen because policies or procedures (unintentionally) exclude or discriminate against groups of people with protected characteristics, such as age, gender, race, or disability. I was recruited to the PEG after I took early retirement from my post in the Equality and Human Rights Team at the Care Quality Commission (CQC), where I was responsible for (amongst other things) ensuring that Equality impact assessments (EIAs) were carried out on CQC’s new policies and procedures. So, I was absolutely delighted to be asked to review Dorset CCG’s EIAs! An EIA helps an organisation to assess its policies and practices to make sure they do not discriminate against or disadvantage people with protected characteristics. They can also improve or promote equality by identifying ways to remove barriers and improve access for people with a protected characteristic. We would like to thank every member of this hardworking and committed group, for their time, contribution and dedication to the NHS in Dorset. 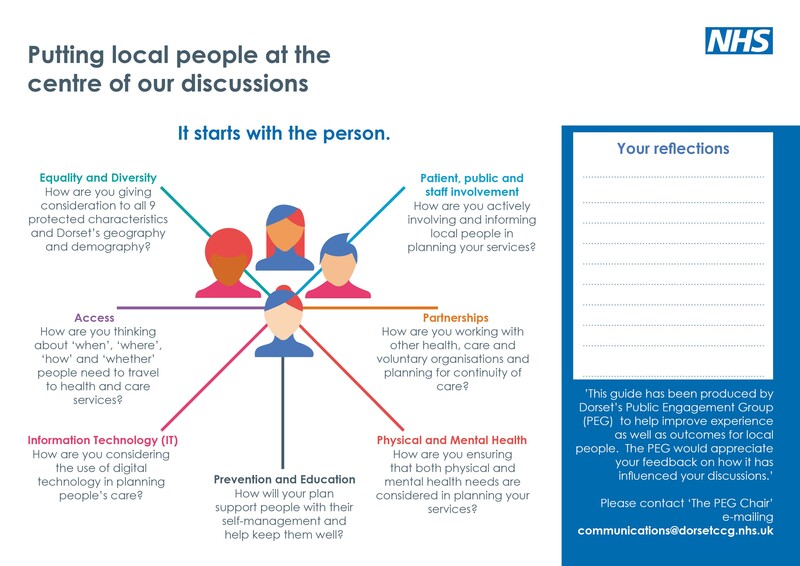 If you have any questions or want to find out more about the PEG please email the team at communications@dorsetccg.nhs.uk.